Internationally recognized as one of the most stunningly beautiful wellness destinations, retreat programs and beaches on the Yucatan Peninsula. Mindfulness Meditation. Vinyasa Yoga. Creative Writing. Art Making. Support for Goals or Intentions. Gourmet Meals. Inspiration. Fun. Healing. Relaxation. For 12 years, the Radiant Retreat has provided an outstanding rejuvenating adventure for mothers, daughters, families, honeymooners, businessmen, artists, writers, therapists, lawyers, fundraisers, TV producers, musicians, teachers, and bankers to be inspired and reconnect with what matters most in their lives. All are welcome. Whether you’re a complete beginner or an advanced practitioner, you can participate in as much or little of the daily scheduled activities as you like. No need to be a “yoga person” or “a writer”. Enjoy: Sun filled days – Sleep – Personal Beach Time – Delicious Cuisine – Site-Seeing – Spa Treatments, Caribbean swims – Fishing – Mayan ruins – Scuba diving – Snorkeling – Biking. Founded byJennifer Schelter, MFA, YTT 500, Founder of Mindful Strategies, Mindfulness at The Wharton School, University of Pennsylvania, Aresty Institute of Executive Education, Yoga Schelter studio, Yoga Unites non-profit, Co-Founder of Yoga On The Steps for Living Beyond Breast Cancer, producer of “am awake” CD and “The Art of Vinyasa Yoga” DVD. She is the life coach and yoga teacher for Veria TV reality show Natural Reboot. Named Best of Philly multiple times, Philadelphia Magazine’s Be Well Philly (cover model), and “One of the Most Inspiring Philadelphians” by US Airways Magazine. She is a recent Post Baccalaureate Graduate of Pennsylvania Academy of the Fine Arts and enjoys working in gouache, watercolor, and pen and ink, as well as video. Maya Tulum Accommodations: Guests sleep in beautiful, simple, yet chic, thatched-roofed cabanas that look as if they could have sprung naturally from the earth. Each cabana comes with a sitting area for relaxing, tiled bathroom with an open shower area, and a generous supply of fresh bottled water. Garden Cabanas windows open to the Caribbean and most enjoy a view of the ocean. Ocean View Cabanas are set slightly back from the ocean with a stunning view. Ocean Front Cabanas sit on the beach with a smashing view. Call (215)840-4972 or email: info@jenniferschelter.com to confirm your payment and reservation. Dates: Plan to arrive March 16 (morning flights best to reach the resort before 4pm) and if you choose to depart on March 23 (we recommend a later flight if possible so you can relax). 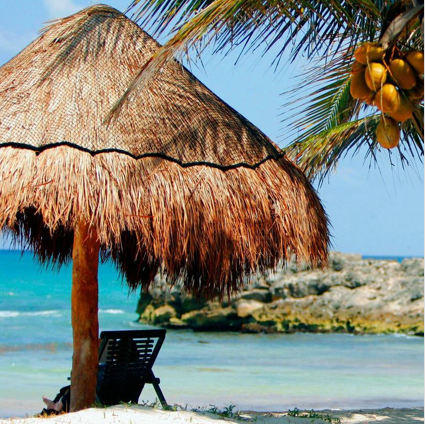 Flights: The price of the retreat does not include airfare or van transportation from Cancun to Tulum. Book from your departure city to Cancun, Mexico. A van will meet you at the airport and take you to Maya Tulum. This is the most economical way to travel from Cancun to Tulum. The cost of the van is paid by each individual passenger and averages between $40-80 (depending on the number of people in your van). Tips for rooms are not included in the price of the retreat. Sample Schedule: (Do as much or little of the retreat program as works for you. You make it your own. 8.15pm – Evening lecture, writing-share, candlelit yoga, moonlit beach walk, relax. To secure your reservation, send payment in the form of a check payable to Jennifer Schelter. Call (215) 840-4972 or email: info@jenniferschelter.com to confirm your payment and reservation. Booking and Payment Schedule is confirmed upon receipt of payment. – February 20th is the absolute final date for booking. All other payments must be received in full by January 31. – If you cancel your reservation after a deposit or booking a processing fee of $100. per person will apply. Jennifer Schelter will issue a check and mail your refund. – If you cancel your reservation 60 days (1/22) of the retreat date 40% of your deposit will be refunded. – If you cancel your reservation 30 days (2/19) prior to the retreat date you will receive no refund. – Payment of Retreat: Gift Certificates are Available. Plan ahead: Ask your friends and family to gift you the trip for your birthday, Christmas or holiday. – Transportation: We organize your transportation from Cancun to Maya Tulum Resort. Each van holds 1-10 people. You will be met at the airport. The cost of the van averages $40-$80. round trip and you are responsible for paying at the front desk of MT when you arrive. – We need your flight departure/arrival information for scheduling your van transportation. – Meals: Breakfast, Lunch and Dinner are served Buffet style in the open aired restaurant. If you have special dietary needs please tell us at the time of booking and we will let the resort know. – Roommate: If you would like a roommate, we do our best to match you up with others who want the same. click and download the Maya Tulum Resort media kit including great images. Come be barefoot for a week in guacamole heaven. Pelicans cruise overhead. Everyone’s face starts to glow. The sun sets and the sky fills with stars. There’s nothing better than being this relaxed, and healthy in a place this enchanting.